When my kids were little we lived on the beach in Los Angeles. The living room had floor-to-ceiling glass and facing west, the sunlight was amazing. Since the tiny beach lots didn’t allow space for a yard, I was a very frustrated gardener. The only solution was to turn the living room into a garden. 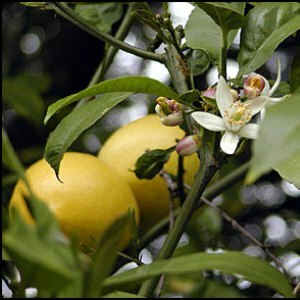 Next to the window I planted a dwarf Meyer lemon tree in a large pot. I watered and fed and babied that little tree and for weeks it did well. Then, one morning when I went to check on it, I found soil spilled on the carpet all around the base of the container. After cleaning it up, the next day the same thing happened. Now, as most of you know I’m an animal lover. When my kids were growing up we had the whole zoo – cats, dogs, gerbils, lizards. As it turned out, the cats had begun digging in the soil around my lemon tree. I couldn’t figure out why until the next time I fertilized. I guess I had “senior brain” even at that young age. I was using fish emulsion! Of course they were going to dig, looking for a fish dinner. My solution was to put decorative rocks around the base of the tree, completely covering the soil. Now all I had to contend with was frustrated cats!